VA Form 0120 is a United States Department of Veterans Affairs form also known as the "Va Police Officer Pre-employment Screening Checklist". 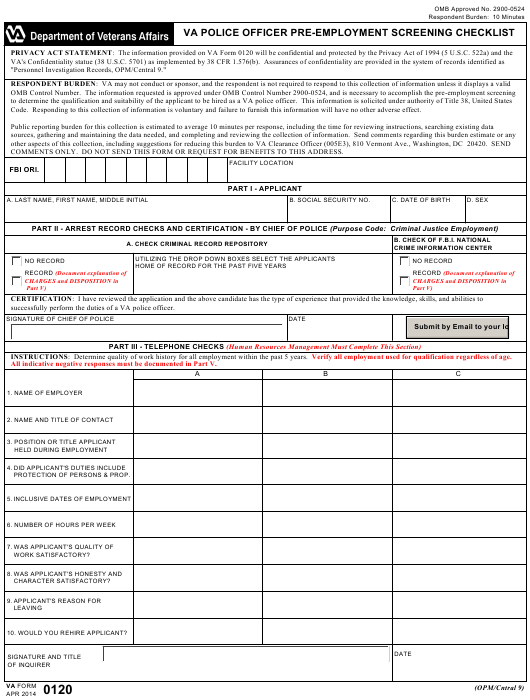 The form was last revised on April 1, 2014 - download an up-to-date fillable PDF VA Form 0120 down below or find it on the Veterans Affairs Forms website. "Personnel Investigation Records, OPM/Central 9." Code. Responding to this collection of information is voluntary and failure to furnish this information will have no other adverse effect. COMMENTS ONLY. DO NOT SEND THIS FORM OR REQUEST FOR BENEFITS TO THIS ADDRESS. successfully perform the duties of a VA police officer. INSTRUCTIONS: Determine quality of work history for all employment within the past 5 years. Verify all employment used for qualification regardless of age. All indicative negative responses must be documented in Part V.
PROTECTION OF PERSONS & PROP. 10. WOULD YOU REHIRE APPLICANT? series. Telephone interviews have been satisfactorily completed and documented in Part III of this form.